Sets A-1 and A-2 each consist of six books, three of which focus on short vowels and three that focus on long vowels. Students with minimal reading skills can read these books from cover-to-cover. They'll have a successful and enjoyable reading experience with lots of decoding practice. 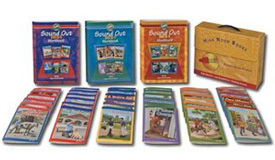 Sets B-1 and B-2 each include six books that give practice in all the decoding skills found in Set A plus two groups of new skills: three of the books focus on consonant blends and digraphs and three focus on diphthongs, controlled vowels, and silent letters. Like Set A, only single-syllable words are included. 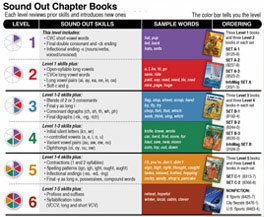 Sets C-1 and C-2 each include six books that give practice in all of the skills found in Sets A and B and add new skills. Three books focus on spelling patterns, inflectional endings, and compound words and three focus on prefixes and suffixes and regularly spelled two-syllable words.